It has been a long time coming. Night photography needs guidance and a wonderfully enthusiastic teacher. The equipment necessary is a tripod, wide angle lens, DSLR camera, intervalometer, and the very important accessory the FLASHLIGHT! This month, I finally participated in an after dark “soiree” with the most wonderful group of night shooters in Boston. Two groups exist in the area, Night Photographers and the Greater Boston Night Photographers. My first trip was a 2 hour drive to Portland Maine’s Head Lighthouse. Getting excited to shoot- I drove up early to see the location in the light. I know it is one of the most photographed Lighthouse’s in the Northeast- but closing in on the setting sun hour and the exiting of the dark storm clouds in the sky- led to the most gorgeous light on the building that every photographer hopes to capture. The ocean was crashing against the waves just like in a Winslow Homer painting. I said as I raced to the waters edge to catch the light “I am actually in a painting”. The following weekend was a trip to the Quincy Quarries. This time I was more prepared, black clothing from head to foot, good hiking boots for the uneven footing surfaces and six different flashlights to navigate in the dark and use to light up the rocks once the dark skies appear. I was in “graffiti heaven”, the drained Quarry is a cavern of many huge rocks littered with words, not just stupid things that kids write to protest whatever, but actually graphics that made sense. Looking at them under the moon lit sky made them so much more interesting. The sky was mostly cloudy but as it cleared little stars arrived and looking up- the leafless trees made for perfect silhouettes in front of the hazy moon. Anyone living in the area please come and take a look at my new work. I will share my excitement for night shooting. I’ve printed the strange Quarry shots on beautiful handmade paper, Portland’s Head Light shots are printed on Epson’s Fine Art watercolor paper, and the night shots of our State House clock tower and night fountain are printed on fabric made into dresses. Come to: Gorse Mill Studios, 31 Thorpe Road, Studio 210, elevator building. I am a photographer who loves to explore everywhere and everything. The journey began in Covington, KY where all the back alleys were sources of great places of visual imagery. After college the desert outside of Tucson, AZ became my place to watch sunsets and seek solitude. Later, NYC was totally exciting and the years there led to a career as a shooter. 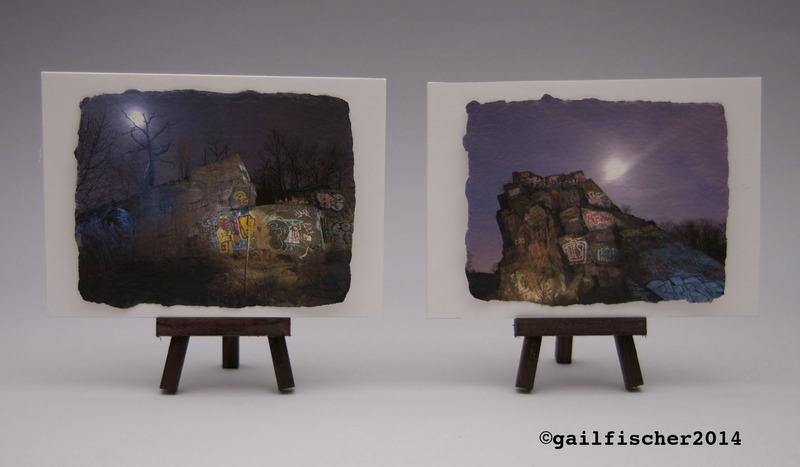 This entry was posted in Uncategorized and tagged alwaysgail photography, custom wearables, DSLR camera, Epson watercolor paper, flashlights, graffiti, handmade paper, hazy sky, MA Artist Open Studios 2014, moon, Needham, night photography, ocean, Portland Head Lighthouse, Quincy Quarry, rocks, silhouettes, Soiree, stars, texture, Winslow Homer painting. Bookmark the permalink. 1 Response to Night Photography Soiree. Working late into the night under the moon and stars. I wish I could come to your show, but I’m still here in Kentucky.